Salam & hello everyone! Today is the last weekend for 2013. I hope all of you are doing well. Recently I have receive this big fat marker. Not your ordinary stationary marker but it is an extra black marker eyeliner from L'Oreal! Claims to be a the thickest marker you ever find, easy to wear and easy to remove. I love how big this marker is, but I took a 2 weeks of try for this product. On application, this eyeliner contains alcohol. I kinda feel a lil sting around my eye while using it. i think this may cause by the alcohol. I have sensitive eyes by the way. The scent of this marker was okay, not too overpowering. It is formulated with Acrylates Copolymer, to help make it last longer and does not fade away. Well here what I thought, this marker serve better for a full bold liner look rather than a thin natural look. I use the basic everyday liner look I usually do and my eyeliner fades around 2 hours. It does not appear pigmented especially on eyeshadow. 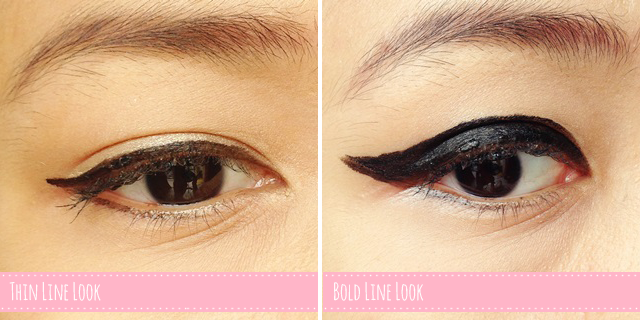 For a bold line look, this serve better. It last longer and it shows up better. The texture of the eyeliner is just like a marker but a lil more watery. Not that watery type where it can cause mess, but just nice to help glides on. I find it is hard to create a thin wing line with this. What I like about this is it is perfect for waterline and bottom eye liner. This help a precises control under there. It is also easy to take off even with baby wipes. Oh yes, this does smudge a lil when there is a contact with water. I recommend the Superliner in gold tube if you are looking for a nice liquid eyeliner for thinner line, and go for this if you wanna rock that bold line look! The big tip make it easier to create it. Just a note, this eyeliner also contains Paraben and Alcohol. I don't really fond for this, I think it does not suits my small eye area. with fine one, yep me too. wow ! pndainya buat wing . wow..that's definitely a thick one! Doesn't it is actually hard to line your eyes? I had a marker type(but not as thick as this) and it is so hard to draw a fine lines..
it was quite hard because one swipe does not look that pigmented, but it is just perfect for filling in eyeliner but not for drawing fine ones. Diggin' the bold line look!